Planning a Florida holiday and looking for February 2020 Orlando flights? We provide advance fares for Virgin, British Airways, United and Norwegian. 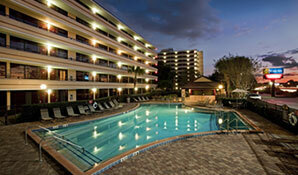 We also book Florida accommodation and car hire – contact us for a terrific package rate. Can you leave in the first week of February? Fares are excellent value. Fly direct from Gatwick or Manchester for a great price. Planning to leave in the second week of February? Prices are a little higher, but you can still achieve a great fare – especially if you avoid the weekends. Mid-week flights are best value – particularly Tuesday and Wednesday departures. Need to leave on February half-term dates? We think Friday 14th and Saturday 15th February will be the busiest dates. For best value, book in advance. Can you leave in the last week of February? Once the half-term holiday is over, prices tend to drop. It’s a great time to grab a bargain. Avoid the weekends. Tuesday and Wednesday flights typically offer the best value. Book early. The sooner you book, the more time we have to find a bargain. We check prices daily and book your seats at the best fare. February 2020 Florida flights are available in March 2019, but we won’t book them on release. Prices fluctuate so we check fares daily. Years of experience allow us to judge when the best price is available. We book the seats at the best possible fare before prices start to rise. We’re always on the lookout for cheap Florida flights, but we never compromise on quality. We book with reputable airlines – BA, Virgin, Norwegian and United are popular choices. Heathrow’s indirect flights are a good choice on peak summer dates but are not worth considering in February. Direct flights from Manchester and Gatwick are decent value throughout the month. Achieving a good fare throughout most of February should be easy. On busy half-term dates, flights to Tampa (on the west coast of Florida) might be better value. If you’re looking for a bargain, this could be an option. If you’d prefer to fly from your local airport, we book connecting flights for a small supplement. Convenient connection times are available from Glasgow, Aberdeen, Inverness, Exeter, Newquay, Belfast, Jersey and the Isle of Man. How much are you expecting to pay for your February 2020 Florida flights? High street fares for February Florida flights can be over £600. If you follow our advice, you could achieve fares of around £345 per adult and £265 per child. We’re already taking bookings for February 2020 Orlando flights, so don’t delay. Remember – the earlier you book, the better chance we have of securing the best fare. Combine February 2020 Florida flights with accommodation and car hire for an excellent package rate. We book all the popular hotels and resorts. We can even save you money on Disney and Universal tickets. Let us know your requirements on our online enquiry form. Better yet, call Alex on 07944 584 659 for an instant quote. Book today with a deposit of just £100 per person. All of our February 2020 Florida flights and holidays are ATOL and ABTA protected. Cut short the cold UK winter and enjoy two weeks of pleasant warmth in America's Sunshine State. Fly direct to Orlando and stay at the Rosen Inn on International Drive, close to Florida's top attractions. Car hire included. February 2020 Florida flights are great value, even on busy half-term dates; the package is a bargain at just £725 each. Book in advance with a deposit of £100 per person, ATOL and ABTA protected.